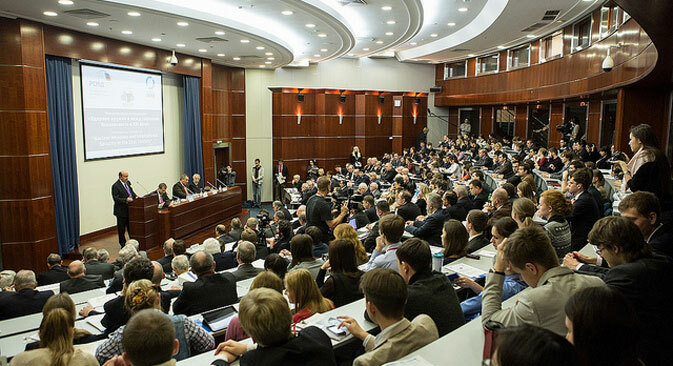 Conference “Nuclear Weapons and International Security in the 21st Century”, on Nov. 8, 2012 by Russian Council. Source: Press Photo. Experts and policy makers gather in Moscow to discuss the pitfalls and potential for progress in nuclear arms reduction. Talks between the United States and Russia over missile defense and nuclear arms reductions have essentially stalled since May 2012 when Barack Obama--with his microphone on-- whispered to Russian Prime Minister Dmitry Medvedev that he wouldn’t be free to act until after the presidential campaign. Well the election is over, and Obama won. Now comes the hard part, so a group of experts and decision-makers from the U.S., Russia, France, Pakistan, Israel and Iran gathered in Moscow this month to discuss the prospects for global arms reduction. Russian officials once again expressed concern about a U.S.-led anti-ballistic missile defense system. Russian Deputy Prime Minister Dmitry Rogozin said nuclear weapons have long played a crucial deterrence role as they “equalized the chances of different powers” and prevented them from engaging in a military confrontation. But Rogozin told the Moscow Nuclear Weapons and International Security in the 21st Century conference that such stability is threatened. Rogozin argued that an anti-ballistic missile defense system created by the U.S. is potentially capable of intercepting intercontinental ballistic missiles and would limit Russia’s ability to maintain strategic parity with the United States. Deputy Foreign Affairs Minister Sergei Ryabkov also spoke at the Nov. 8 conference, which was sponsored the Russian Council on International Relations (RIAC), the Moscow State Institute of International Relations and the Global Zero project. Richard Burt, the former U.S. ambassador in Germany and the head of the Washington-based Global Zero project, which advocates for the elimination of all nuclear weapons, said the U.S. and Russia should redesign rather than reset their relations. He said the two countries have an opportunity to cooperate in resolving nuclear proliferation issues all over the world, especially in Iran and North Korea. The development of missile defense by the U.S. and its allies, as well as hypersonic weapons and sophisticated precision-guided munitions, reduce the need for nuclear weapons. But these technological breakthroughs also increase the sense of insecurity in other powers. A number of countries see nuclear weapons as a hedge against the gulf in military capabilities of their rivals and other powers. But shifting the environment from a “zero-sum game” to an environment of international cooperation requires a level of trust that is still lacking 20 years after the end of the Cold War. Russian government officials insist that American statements that any missile system will not be aimed against Russia are inadequate. “We do not trust words even when they are put on paper. We need guarantees not on paper but in metal” said Rogozin, meaning that U.S. missile defense development reduces the impetus to reduce stocks of nuclear warheads. If anything, it makes Russia more determined to keep them. Rogozin did say that the two countries should continue to pursue trust-building measures that would contribute to enhancing international security, including increased military cooperation between Russia and NATO as well as changing military planning.